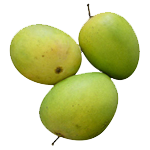 Langra is one of the most superior varieties of Mango from the Northern Indian sub-continent. It conjures the image of a person whose purpose in life is carefree joy and enjoyment!! Langra lovers typically live their life for Langra. To them, there are only two states of life: Life-with-Langra and Life-without-Langra!! The long Life-without-Langra is spent eagerly awaiting the Life-with-Langra. The Langra keeps it’s greenish tinge during the ripening process. It gives out a sweet ripening smell when ripe and is full of juice and pulp !! The best time for this Mango is during the last two weeks of July.